d’Elsa, ideal for visiting picturesque villages such as San Gimignano, Castelfalfi and Volterra. UNAHOTELS Palazzo Mannaioni Toscana is located in the centre of Montaione, a mediaeval village rich in history and traditions. Surrounded by the green hills of the Valdelsa, Montaione is the perfect spot to enjoy a vacation in close contact with nature, while at the same time being in a location that allows visitors to easily reach the region’s most important art heritage cities (Florence, Siena and Pisa are all a mere 50 km away) as well as breath-taking villages such as San Gimignano, Volterra and Certaldo. 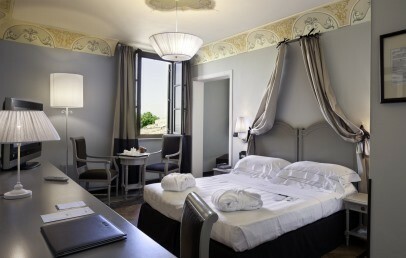 UNAHOTELS Palazzo Mannaioni Toscana greets its guests in the very heart of mediaeval Tuscany, offering them the prestigious welcome of a sixteenth century noble residence and relaxing views over the countryside that the region is so famed for. An exclusive haven, born of the meeting of the refined ambiance of an historic residence and the attentive and discreet service of UNA Hotels & Resorts. Guests can relax by the outdoor pool from May to October and enjoy the Pool Bar service available from 11:00am until 6:00pm. The 47 rooms at UNAHOTELS Palazzo Mannaioni Toscana are split between the original historic building and the new building: the classic and enchanting ambiance of the first, reminiscent of traditional Tuscan country homes, placed alongside the fresh and relaxing design of the new rooms that evoke the elements of the natural surroundings. The hotel has 4 adapted rooms available for guests with limited mobility. All rooms offer free Wi-Fi. Classic - 15 m², double bed or twin beds, bathtub or shower, view of the countryside or village. Superior - 20 m², double bed or twin beds, bathtub or shower, some rooms offer a private outdoor relaxation area. Family - 20 m², double bed or twin beds, third bed or cot, bathtub or shower, view of the countryside or village. Junior Suite - 18-25 m², double bed or twin beds, bathtub or shower, balcony with garden view, some rooms offer a private outdoor relaxation area. Suite - 30 m², double bed, day area with sofa-bed, shower, partial views of the hills. Family Suite - 30 m² double bed, day area with sofa-bed, two bathrooms with shower, balcony with partial views of the hills. Hotel guests can take advantage of a special rate offered by the nearby golf club Castelfalfi Golf Club, located a few kilometres from Mannaioni. Mountain bikes can also be hired or guests can opt for an outing on horseback, and trekking fans can head out and explore the many marked routes that cross the beautiful territory of the Valdelsa. The hotel’s popular Ristorante Mannaioni offers a creative twist on Tuscan traditional dishes while upholding local traditions and standards. Located in the former olive oil mill, the welcoming dining area offers a delightful vaulted brick ceiling. Upon request, the chef can organise cookery classes followed by tastings of the dishes prepared by guests. Included in the room rate: free Wi-Fi throughout the hotel, use of the pool and sun deck, and Pillowow, our service that allows you to choose your pillows. An ironing service is available upon request as well as use of a private garage (at a supplement). Tourist tax – The municipality of Montaione requires the payment of a tourist tax to be paid on spot. 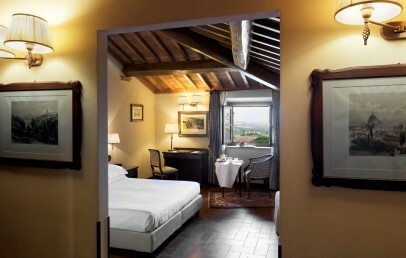 The classic rooms in the original part of the residence epitomise the classic style of Tuscan country homes with exposed wooden beams, parquet or terracotta floors and lavish frescoed decorations. New classic rooms, located in the new building, have a modern country design in which the light wood of the furnishings and the dark wood of the parquet create a decorative style reminiscent of the secret life of the forest. All classic rooms offer a warm and welcoming ambiance, stunning views over the countryside or village and all technological modern comforts. 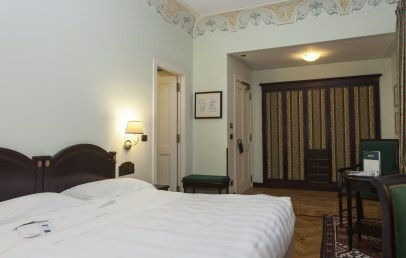 Welcoming double or twin rooms, superior rooms are located in the original part of the residence and offer a classic design, some with terracotta flooring and exposed wooden beams, others with parquet and Renaissance-era frescoes. Some rooms offer a view, other rooms are more spacious. 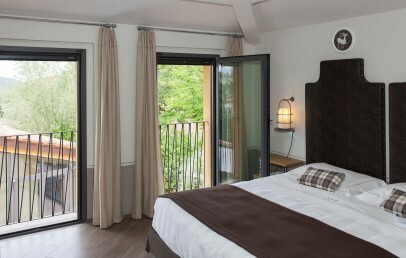 The new building hosts our New Superior rooms with country-inspired light wood furnishings. New superior rooms on the ground floor offer a private outdoor relaxation area while the rooms on the upper floors are more spacious. The Junior Suites in the original residence (18 m²) overlook the Italian-style garden and offer a large balcony with garden views. 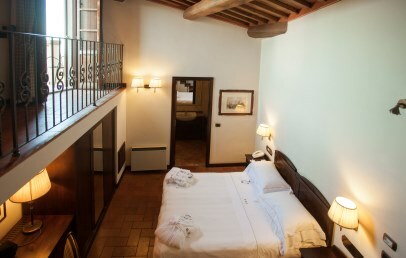 These rooms have a small furnished loft and terracotta flooring and exposed beams (with the exception of one suite that has parquet flooring and a painted ceiling). 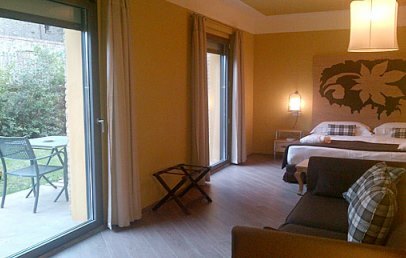 The new building hosts the New Junior Suites – large rooms (25 m²) with a country design and soft colourings. Some rooms, located on the ground floor, have access to a private outdoor relaxation area. The original residence hosts our large suite, split into a double bedroom with canopy bed and a small living room with sofa-bed. The suite overlooks the garden and has a balcony with partial views of the hills. 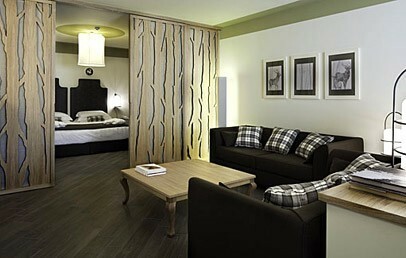 The family suite is split into a double bedroom with canopy bed and a small living room with sofa-bed. The room offers two bathrooms, both with shower.